The complete online solution for the small to medium sized equipment hire operator, automating your entire hire process. He rents out bike boxes. To hire a box a customer first checks his website then completes an online form that gathers their details and requirements and sends them by email to the client. Who checks availability and gets back to with confirmation. The problem was this process can take a day, or even two if it's a weekend, in which time the customer has often sourced the bike box from elsewhere. The client estimated it was costing him about £100 a week in lost rentals, so he came to us. 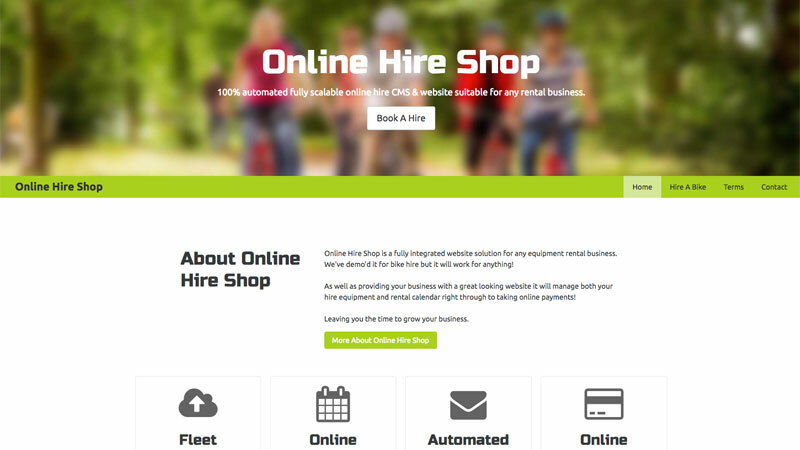 Initially, we looked at adding one of the many cloud-based rental solutions to his site but these were very expensive; affordable if your hire business turns over huge amounts, but not for the smaller hire operator. So we started to look for off the shelf modules and found one that almost fitted the bill, but not 100%. A few emails later and the creator of the module agreed to adapt it for us. Long story short, The client were so pleased with it that we licensed a specific version of the module exclusively for use by us on any of our sites. So here we are with a template site to show it off. Now it's fair to say it's not as all singing/all dancing of some of the cloud-based hire solutions out there, but with these costing many hundreds (often thousands of pounds) just to deploy, plus some hefty monthly licence fees (£70-100 is the norm), we feel our online hire shop more than meets the needs of our typical clients requirements and is fanatically cost effective for the smaller operator. So, if you're in the business of managing a hire fleet, have a look over the demo site and learn about its great features. And remember, this module can be added to any website we build, typically adding about £100 to the setup fee and about £20 to the monthly hosting cost. Client-side Content Management You can add a limitless amount of items to your hire fleet and edit/update them from any device. Complete Hirer Management Our hire module stores all your hirer details in a secure database, meaning no more bits of paper. Automated Calendar Scheduling Our hire module manages the hire schedule for every item in your hire fleet, so the customers can see what is available in real time. Online Payments The hire module connects to most payment gateways, including Paypal, for instant hire charge payments, in full or part. Email Notifications You get emails when a hire process is commenced and payment is received, and when a hire agreement is cancelled. The customer gets a confirmation email once payment is received so they know their booking is good.